The rain made it feel much longer than the five minutes we waited outside Tokyo's Kichijōji Station. We were there for a strange reason: we were meeting a middle-aged man (a.k.a. an ossan) we had rented for the night in order to review the Ossan Rental Service—a service that does exactly what its name implies. When we pictured an ossan, we imagined a fifty-something-year-old man in a conservative business suit. 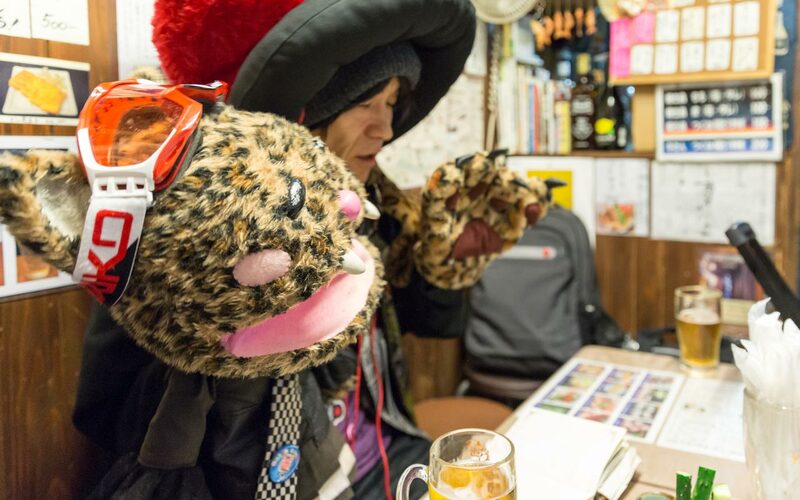 Yet the photo we had of Omocha-kun, the ossan we were meeting, was the complete opposite: a middle-aged Japanese guy, yes, but everything else—from his don't-give-a-damn haircut to his punkish clothing—was definitely not what we expected. Not to disappoint, he strolled up out of the rain, pulling a suitcase filled with who knows what (actually, I knows what, and you'll know very shortly) and holding an umbrella. 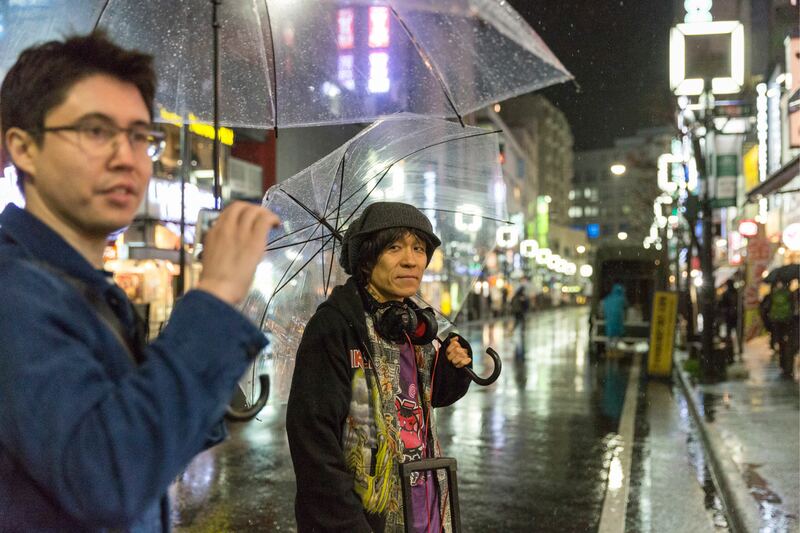 (At least the umbrella was typically Japanese.) "Hello," he said. "I'm an Ossan Rental rookie, Omocha-kun. Nice to meet you. This is my wig." He flashed his bald head beneath. We were quickly learning that whatever our expectations might have been of an ossan, ours was ready to smash them. As it happened, Omocha-kun was the first of two ossan we would be renting. (You can read about the other one here.) With Ossan Rental service, you make a request to the ossan about what you would like to do. 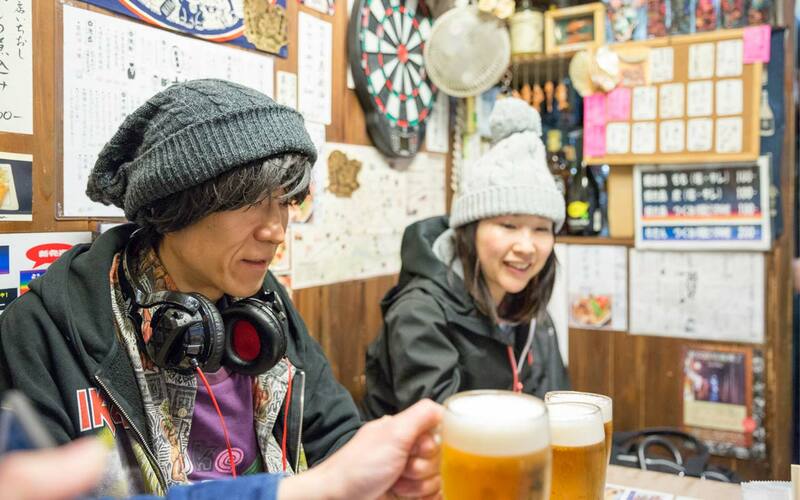 Although we had an ulterior motive—interviewing him about his experience renting himself out—our official request was to show us around the bars of Harmonica Yokochō, a popular drinking district. But when we asked him what he liked to drink, and if he had any recommendations, he said, "Actually, I barely drink at all." We looked at each other, wondering why he accepted the job. Still, we didn't worry about it. You can still have a good time without drinking! "Let's go look around," Mami suggested. With Omocha-kun at our side, we walked up and down the streets and alleyways of Harmonica Yokochō, some of which could barely fit two people across. The district got its name because from above, the long skinny rows of alleys supposedly look like a harmonica. (I looked at a map once, and I wasn't convinced.) Still, it's a fun place to explore. After checking out every shop, we decided to settle near the back corner in a small, hole-in-the-wall drinking place called Hanachan. It was there we proceeded to interview our very first ossan. Mami had the first question: "When did you join the rental ossan service?" "I joined maybe two months ago, but I've only been rented once so far. I'm definitely still a rookie." "What was your other rental job?" "Hello," he said. "I'm an Ossan Rental rookie, Omocha-kun. Nice to meet you. This is my wig." He explained that he was hired to be an audience member for a comedy duo's show. "They wanted me to give them a good review on the questionnaire afterwards," he said. "I wrote that I thought their show was really funny. That's the only time I've been an ossan before now." "So what do you do usually, then?" Mami asked. "Usually I get up at noon. I live in Shinjuku, and there are a lot of different lunch buffets there, so I usually go to one of them. Since there are around twenty of these places, I can go to a different one every day. The cost is around ¥1,000 to ¥1,500 per meal, and it's all-you-can-eat. After that I go to an Internet cafe for a few hours. I go back home at around 7 p.m. and read books while watching television. That's my basic daily life. Sometimes I'll go out for a random part-time job, or I'll be on a TV show or something." "What kind of part-time jobs do you do?" 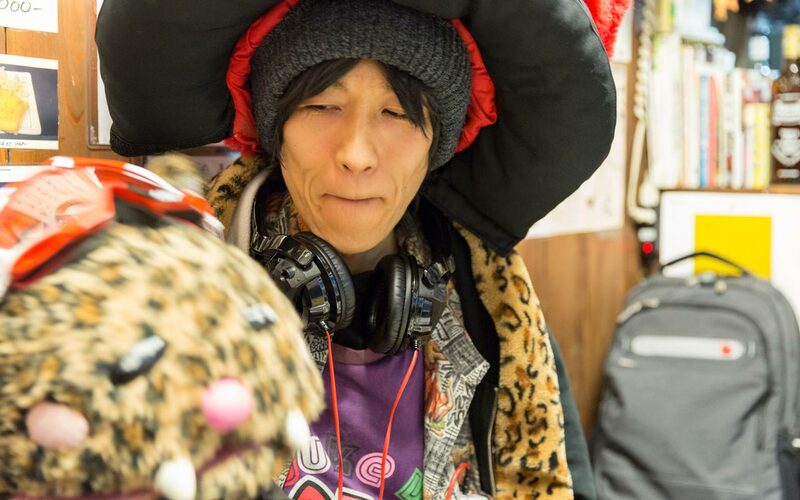 "I live near Shinjuku's Kabukichō, so I'll often get a love hotel job. You know, making beds, etcetera." 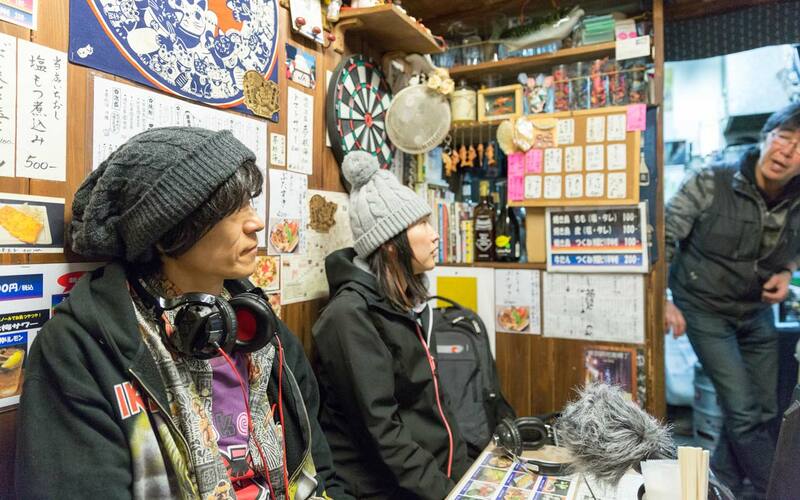 "There are a lot of host clubs in Kabukichō," said Mami. "We thought maybe you'd work as an ossan host at a host club or something." She was only partly joking. "Oh, I've done that before! I saw a job ad for a host club named Dice. I applied and went to the interview. I'm forty-eight now, but I was forty at the time. The interviewer told me it would be too difficult for me because of my age. I told him: 'I don't need the money, so could you let me work here for free?' He agreed, and I did it for a couple of months. I never became any of the clientele's favorite hosts, though, and was never called to specific tables." Koichi asked, "You said sometimes you're on TV?" "Yep, sometimes—TV or movies. I was one of the Titans in Attack on Titan, the live-action film. The huge, sixty-meter titans are completely CG, but the five- to fifteen-meter titans are all played by people. I'm one of them. They put me in makeup and some tiny underwear, shot my scenes, and made it better with CG. I was in a lot of scenes, actually, but the one that stood out the most was one where I was chasing Miura Haruma and stumbled and fell down and got stepped on and crushed by the other titan. I'm in some other scenes as well, but my character would always encounter some kind of terrible ending. In the audition, I had to be naked. I'm really skinny and my ribs show very clearly; I look like a super weak titan. They gave me the name 'Skeletal Titan Who Always Encounters a Terrible Ending.' The small titan in the American-version trailer is me!" He went on: "TV and movie jobs aren't that common for me. That's half of what I do, with the other half being odd jobs. I also do street performance." "What kind of street performance?" "I don't do it in Japan too much anymore, but my thing is I can sing songs in the languages of many countries." "How many can you sing?" Koichi asked. "Pretty much all of them. I can do around two hundred countries. I sing their national anthems." This was getting interesting! "But you said you don't do it much in Japan anymore?" "That's right. There was a… disturbance. You know that there's a street tax, right?" "It turns out you have to pay the yakuza to use a space like that. They came up to me while I was performing years ago. They didn't yell 'Pay us!!' or anything like that—not at first. First they took my picture. Then they came up later and said, 'You're so good! What's your name?' I said, 'I'm Omocha-kun.' Then they showed me their phone and said, 'Can you call this number?' By then I had figured out that they were yakuza, so I had no choice but to call." "Three days later they called me and asked if I was coming again next week. I told them I wasn't, and haven't gone back to Harajuku since. I moved on to Shibuya, but I still worry that the yakuza will show up. It's why I haven't performed much in Japan recently. 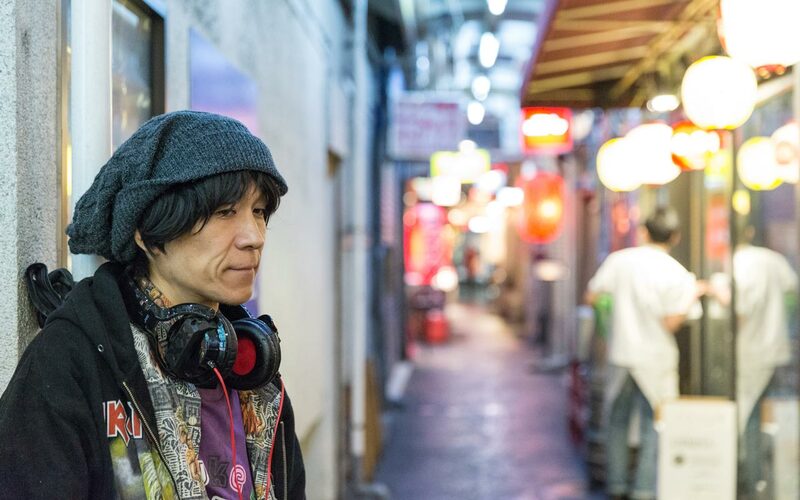 Back then, though, I was making around ￥10,000 (~$100) a day." "You keep saying 'in Japan,'" Koichi said. "Do you perform in other countries as well?" "Yes," Omocha-kun said. "I went to around fifteen countries over the course of a couple of years. When I was in New York, I performed in Times Square, but the police told me I had to go somewhere else. So I went to Washington Square, where there are a lot of performers. Americans love to hear their own national anthem!" He gave us more details. "I use a headdress and a puppet to get more attention, and carry a sign that says I can sing songs in any language. Especially in New York, there are people from all over the world, so people from random countries would ask me to sing a song from their country. Like, 'Can you sing a song in my native language, Armenian?'" "Sure. Want to hear it?" At this point, Omocha-kun pulled a giant puppet out of his bag and put his hand inside of it. "Hello. I am Omocha-kun," his puppet said. "You're not good at ventriloquism at all, huh?" said a random person who was sitting drinking at a nearby table. He wasn't wrong. Omocha-kun (the ossan, not the puppet) opened a notebook and showed us. Inside were lyrics for the national anthems of every country. It was heavily worn and filled with notes. He flipped to "Armenia" and sang it. After that, he sang Bhutan's. None of us knew much about either of these languages, so we can't confirm whether it was good or not. But it sounded good to us! "The national anthem of Bhutan is like a magic spell," he said after he finished. "I think it is the most unique national anthem." We had a few more questions. "Where did you make the most money doing this?" "Hong Kong. I sang Sam Hui [cover] songs over there, and they loved it. I was told I sing them perfectly. I even got to go on stage with him at a concert in Malaysia once because of it." Now it was time to ask the puppet a question: "What's next for Omocha-kun?" The puppet's master answered. "I think I'll be going to Holland, the UK, and Germany, where there's a reunion concert for some of my favorite bands. I like music and was in a punk band when I was young. I've released a couple of CDs. Anyway, I'll go for that. Then I'll do street performances around the area." As fascinating as Omocha-kun's story was, by this point our paid time had run out. Ossan are rented by the hour, and it was time for ours and his puppet to pack up and head home, to read books while watching TV. We thanked him, bid him goodbye, and watched him waddle off into the rain, his puppet safe and dry inside the case he towed along behind him. Before we left Hanachan, the owner of the bar asked us to tell our readers that Omocha-kun isn't a good representation of Japanese people. I don't think we have to worry that you'll think anything like that… right? Our first ossan was certainly unique, and we enjoyed meeting him. We knew he wasn't typical, and that was one of the reasons we found him so interesting. 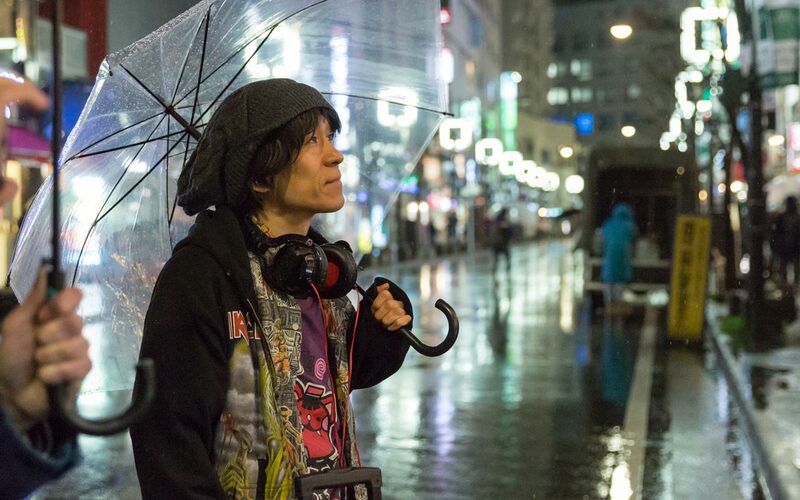 If you liked Omocha-kun's story and want to hear about a more typical ossan, you'll want to read our interview with Yasashii Shufu-san, the second one we rented. Or you can check out our review of the Ossan Rental Service. And if you're a middle-aged Japanese man who's reading this—maybe you've found yourself a new career!